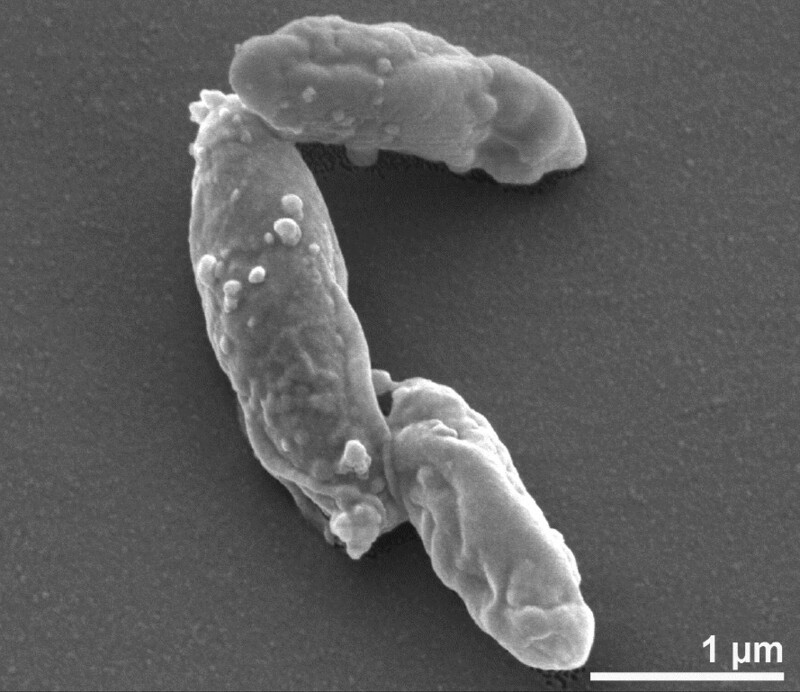 D. nigrificans and D. carboxydivorans are Gram-positive, sulfate-reducing, rod shaped bacteria with rounded ends (0.3–0.5 µm thick and 3–6 µm long ; 0.5–1.5 µm thick and 5–15 µm long , respectively) (Figure 2 and Figure 3). They have a similar temperature range for growth and can both grow optimally at 55°C. Additional similarities can be found in the substrates used for growth. Both D. nigrificans and D. carboxydivorans can grow with fructose, glucose and alanine. These substrates are incompletely oxidized to acetate, coupled to sulfate reduction. Other suitable electron acceptors in addition to sulfate are thiosulfate and sulfite. Neither nitrate nor elemental sulfur are used as electron acceptors. D. nigrificans and D. carboxydivorans were selected for sequencing in the DOE Joint Genome Institute Community Sequencing Program 2009, proposal 300132_795700 ‘Exploring the genetic and physiological diversity of Desulfotomaculum species’. They are important for their position in subgroup a of the Desulfotomaculum cluster 1. Sequencing the complete genome of the two strains was proposed as it would allow the study of the genetic and physiological diversity within subgroup a. Furthermore, a comparison of the two genomes should reveal the genes involved in CO metabolism and the H2 production in D. carboxydivorans. The genome projects of D. nigrificans and D. carboxydivorans are listed in the Genome OnLine Database (GOLD)  as project Gi03933 and Gc01783, respectively. The two complete genome sequences were deposited in Genbank. Sequencing, finishing and annotation of the two genomes were performed by the DOE Joint Genome Institute (JGI). A summary of the project information of D. nigrificans and D. carboxydivorans is shown in Table 3. D. nigrificans and D. carboxydivorans were grown anaerobically at 55°C in bicarbonate buffered medium with lactate and sulfate as substrates . DNA of cell pellets was isolated using the standard DOE-JGI CTAB method recommended by the DOE Joint Genome Institute (JGI, Walnut Creek, CA, USA). Cells were resuspended in TE (10 mM tris; 1 mM EDTA, pH 8.0). Subsequently, cells were lysed using lysozyme and proteinase K, and DNA was extracted and purified using CTAB and phenol:chloroform:isoamylalcohol extractions. After precipitation in 2-propanol and washing in 70% ethanol, the DNA was resuspended in TE containing RNase. Following a quality and quantity check using agarose gel electrophoresis in the presence of ethidium bromide, and spectrophotometric measurement using a NanoDrop ND-1000 spectrophotometer (NanoDrop® Technologies, Wilmington, DE, USA). D. nigrificans and D. carboxydivorans are able to utilize glucose and fructose as electron donors in the presence of sulfate. Additionally, both species are able to ferment fructose, although fermentation of glucose is only reported for D. carboxydivorans [5,6]. The capability of utilizing sugars for growth is unusual among Desulfotomaculum species. The other Desulfotomaculum species that belong to cluster I, sub group a, D. ruminis, D. aeronauticum, D. putei and D. hydrothermale (with the exception of “D. reducens”), are not able to grow with glucose or fructose [34–36]. Glucose metabolism in D. nigrificans was studied before . Akagi and Jackson showed that the majority of the glucose was degraded by the Embden-Meyerhof-Parnas pathway and in several instances the glucose followed the Entner-Doudoroff pathway . The Embden-Meyerhof-Parnas pathway and the pentose phosphate pathway are predicted to be complete in the genome of D. nigrificans and D. carboxydivorans. 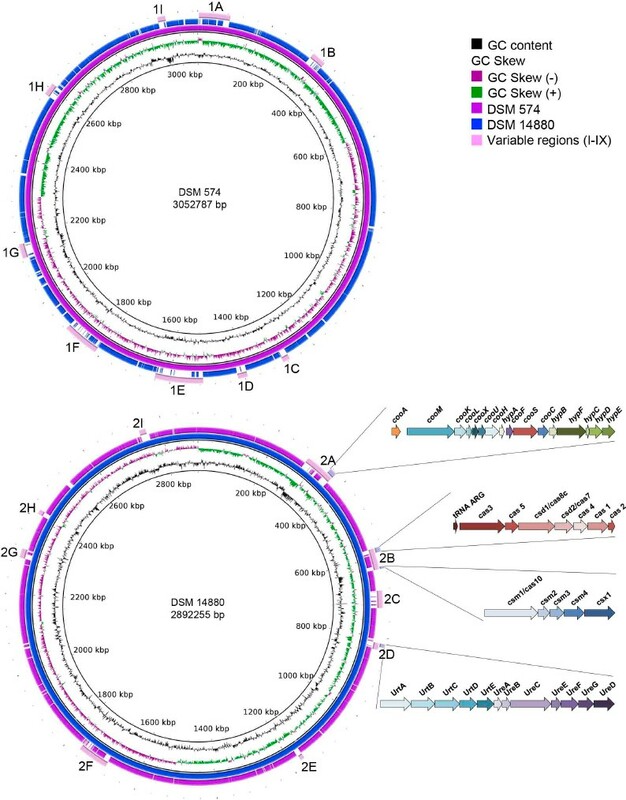 However, genes coding for the 6-phosphogluconate dehydratase and the 2-keto-3-deoxy-6-phosphogluconate aldolase, the two characteristic enzymes of the Entner-Doudoroff pathway, were not found in the genome of D. nigrificans and D. carboxydivorans. A phosphotransferase system (PTS) for glucose-specific transport was not found in either genome. Such a system is present in the genome of the glucose-utilizer D. reducens (Dred_0332). Genes coding for the fructose-specific PTS are present in an operon structure in D. nigrificans (DesniDRAFT_2286 and 2291) and D. carboxydivorans (Desca_2698 and 2703). This system is likely involved in fructose uptake and its subsequent phosphorylation to fructose-1-phosphate. The fructose-1-phosphate thus formed can be further phosphorylated by 1-phosphofructokinase to fructose-1,6-bisphosphate (DesniDRAFT_2290 and Desca_2702). D. nigrificans and D. carboxydivorans are able to grow with CO in the presence of yeast extract. 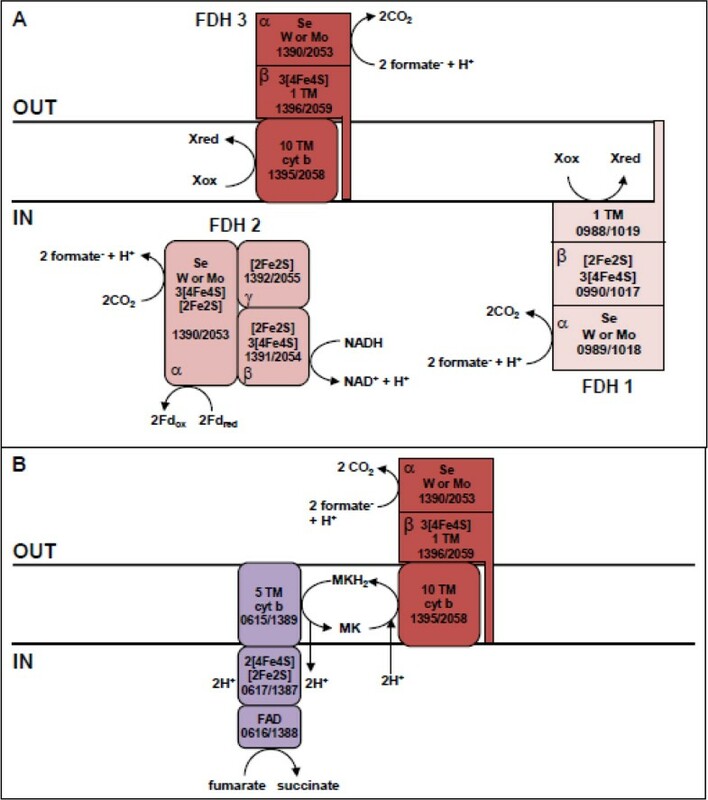 However, D. nigrificans grows with up to 20% of CO coupled to sulfate reduction, while D. carboxydivorans can grow with 100% CO with and without sulfate. These physiological differences should also be visible in the genome for the genes involved with carbon monoxide dehydrogenase (CODH). Figure 5 shows the organization of the CODH catalytic subunit (cooS) and neighboring genes in D. nigrificans and D. carboxydivorans. D. nigrificans has two cooS genes in the genome (DesniDRAFT_0854 and 1323) while D. carboxydivorans has three (Desca_0349, 1148, 1990). The organization of the cooS and neighboring genes in D. nigrificans is similar to that of two of the cooS and neighboring genes in D. carboxydivorans. However, one cooS gene cluster in the D. carboxydivorans genome cannot be found in the genome of D. nigrificans. 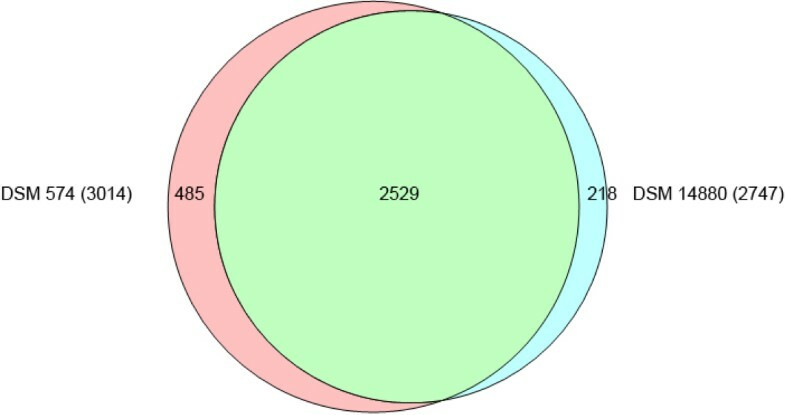 The genes in this cluster are similar to genes described to be involved in the H2 production from CO oxidation [38–41]. Carboxydothermus hydrogenoformans was the first bacterium described to have multiple cooS genes, one of which is united in a cluster with hydrogenase genes . The hydrogenase module of this gene cluster represents a membrane-bound energy-converting hydrogenase (ECH) capable of energizing the membrane by proton translocation. 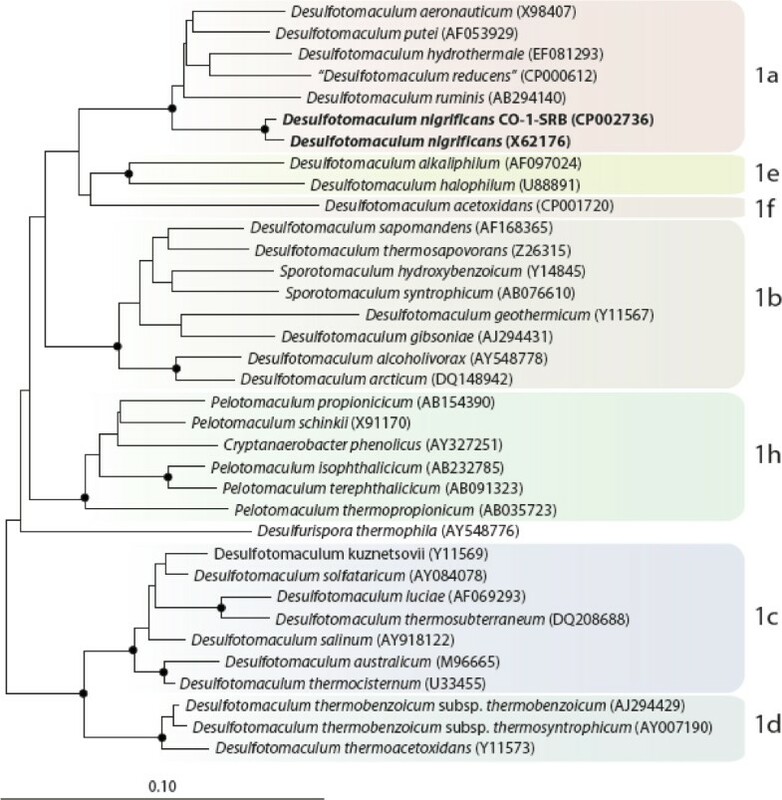 Among sequenced Desulfotomaculum species, only D. carboxydivorans, D. acetoxidans, and D. ruminis possess putative genes coding for ECHs. However, in the latter two genomes, ECH encoding genes do not cluster with cooS genes. Earlier analysis showed that clustering of cooS genes and ECH genes is a characteristic feature of hydrogenogenic carboxydotrophs . The presence of the putative ECH-cooS gene cluster in D. carboxydivorans explains its ability to grow hydrogenogenically on CO. The genes for the assimilatory sulfate reduction are organized in an identical way in D. nigrificans and D. carboxydivorans. 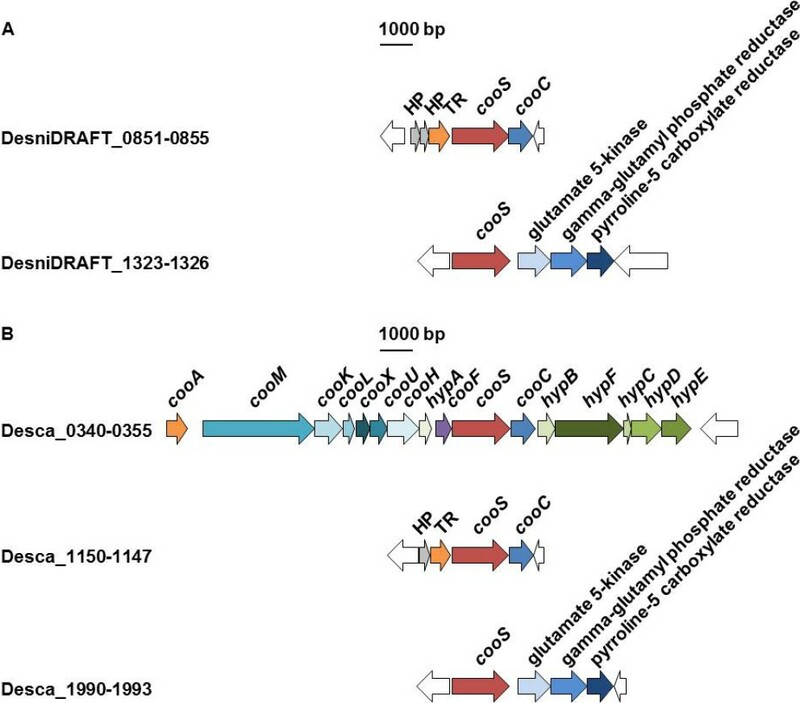 ATP-sulfurylase (DesniDRAFT_1837, Desca_2237) is followed by adenosine-5´-phosphosulfate (APS) reductase (DesniDRAFT_1836-1835, Desca_2378-2377), and the QmoAB complex (DesniDRAFT_1834-1833, Desca_2376-2375). A qmoC gene is absent but seems to be substituted by heterodisulfide reductases (Hdr) CB (DesniDRAFT_1838-1839, Desca_2381-2380). This organization is also found in D. ruminis and D. reducens. The position of the HdrCB is switched to the other side in D. acetoxidans, D. gibsoniae, D. alcoholicoviorans, Desulfurispora thermophila, and Desulfarculus baarsii (which owns a Gram-positive aprBA ). 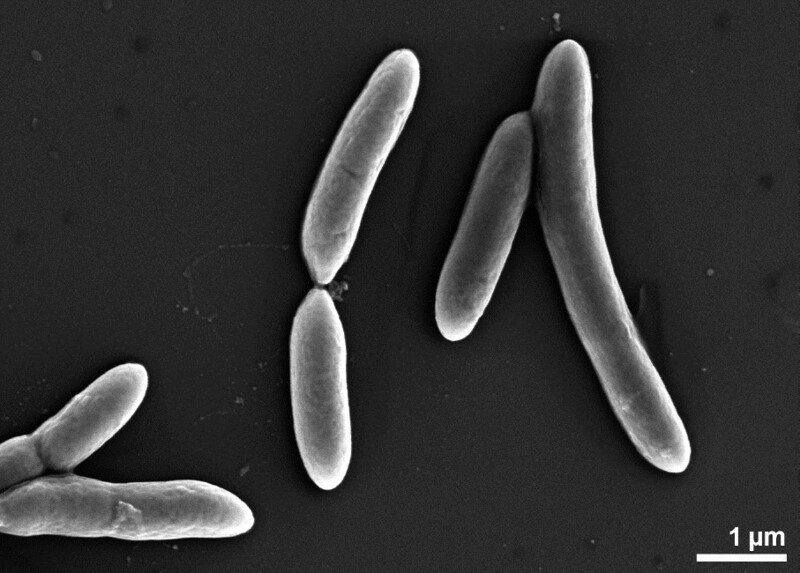 In contrast to these organisms, D. kuznetsovii, Ammonifex degensii, Desulfovirgula thermocuniculi, and Gram-negative sulfate-reducing bacteria which posses a Gram-positive aprBA  like Desulfomonile tiedjei and Syntrophobacter fumaroxidans have a complete qmoABC complex (for D. kuznetsovii: Desku_ 1075, Desku_1076, Desku_1078). The cells are Gram-positive, rod-shaped with rounded ends, 0.3–1.5 × 2–15 µm, single or sometimes paired. Motility with tumbling or twisting movements conferred by peritrichous flagella. Terminal or subterminal oval endospores that are slightly swelling the cells. Thermophilic and neutrophilic with an temperature optimum of 55°C. NaCl is not required for growth. The following substrates are utilized, coupled to the reduction of sulfate to sulfide: DL-lactate, pyruvate, ethanol, L-alanine, D-fructose, D-glucose. Acetate and methanol are not utilized. Substrates are incompletely oxidized to acetate. In the presence of 0.5 g/l yeast extract, lithoheterotrophic growth is possible, such as growth on H2 and CO2 with sulfate or growth on 20% CO with sulfate for D. nigrificans strain Delft 74 and growth on 100% CO with or without sulfate for strain CO-1-SRB. Suitable electron acceptors with lactate as substrate are sulfate, sulfite and thiosulfate, but not elemental sulfur or nitrate. Fermentation of pyruvate and fructose; strain CO-1-SRB is also able to ferment DL-lactate, glucose and CO. The prevalent respiratory lipoquinone is MK7 with only small amounts of MK6. The dominating cytochromes are of type b. Major cellular fatty acids are 16:0, iso 15:0, iso 17:0, anteiso 15:0, 18:0 and iso 16:0. The DNA G+C content is around 46 mol%. The type strain is Delft 74 (=NCIMB 8395 = DSM 574 = ATCC 19998 = NBRC 13698). Venn diagram plotter available from the Pacific Northwest National Laboratory Software Distribution Center: http://omics.pnl.gov.